Alice in Zombieland??? This Sounds AMAZING! I love that retellings of stories are so popular right now, and Alice in Wonderland was definitely one of my favorites as a child. The cover is stunning as well, and it always helps that Harlequin Teen has some really amazing books. I can't wait to check this out! wooooo, looks good! Adding it to my list now! I've heard heaps about this and it's been spotlighted a bunch of times! I think September needs to come around sooner! I saw the cover when it was released and I fell in love. 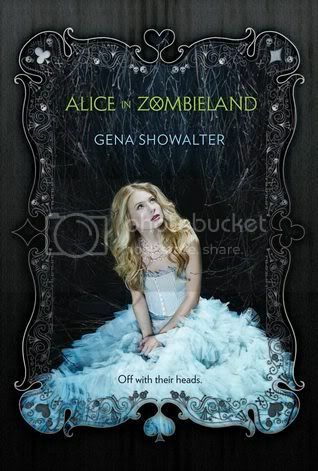 The story sounds awesome because it is Alice in Wonderland mixed with zombies. It should be an interesting story :) Awesome pick! Your right this book does sound awesome! Will keep my eye out for this one. I have my eye on this one for quite awhile now too. I love reading fairytale remakes (such as Cinder) with a funky twist inside. Great choice! I agree, this sounds amazing and the cover is gorgeous. Love the new take on a known story. I'm looking forward to this one, too! Haven't read anything by the author before. This might be my first Gena Showalter book. I have seen this one around. It looks great! This book sounds AMAZING.. a very dark twist to the children's version! Seriously! I feel like I've been seeing this book EVERYWHERE which makes me more excited to read it. I'm always a fan of Alice in Wonderland. This one looks really good! I'm looking forward to reading some reviews on it! When Gena Showalter writes YA its epic!!! Can't wait For this one either!! WOOW !! I hadn't heard about this book until now.. Thank you Christy, it sounds amazing !! I love Alice in Wonderland too .. I have a beautiful leathered hardcover copy of the classic but haven't read it yet but I'm planning on doing so this summer .. Anyway, I can't wait for this one too now :) ! YEAH!!! I can't wait for this, I absolutely adore Gena Showalter's books:) I need this book immediately! OH HELLZ YEAH! I can't wait for this one. Really love Gena's adult novels and I do love a good retelling. That's double love there, people. Double. Love. This one sounds awesome! That title is so catching! I LOVE the sound of this and the title. Wonderful pick, Christy! This sounds awesome, and I hadn't really heard of this before. I love the cover and usually end up liking HarlequinTeen books so this is being added to my reading list!